An obscure ordinance published by the Department of Commerce in 1928 has had arguably the largest affect on how U.S. cities are developed. But a new, simple, two-sentence subdivision ordinance could actually result in much better places, and much better cities. In 1926 the United States created a legal precedent for zoning our cities, through the decision in the Euclid v. Ambler case. This was further reinforced with the publication of the final Standard State Zoning Enabling Act. Zoning, for better or worse became, and still is, the primary way we think about planning cities. The most important result of this is an environment in which we plan cities primarily by locating uses (even if those uses are mixed-uses). 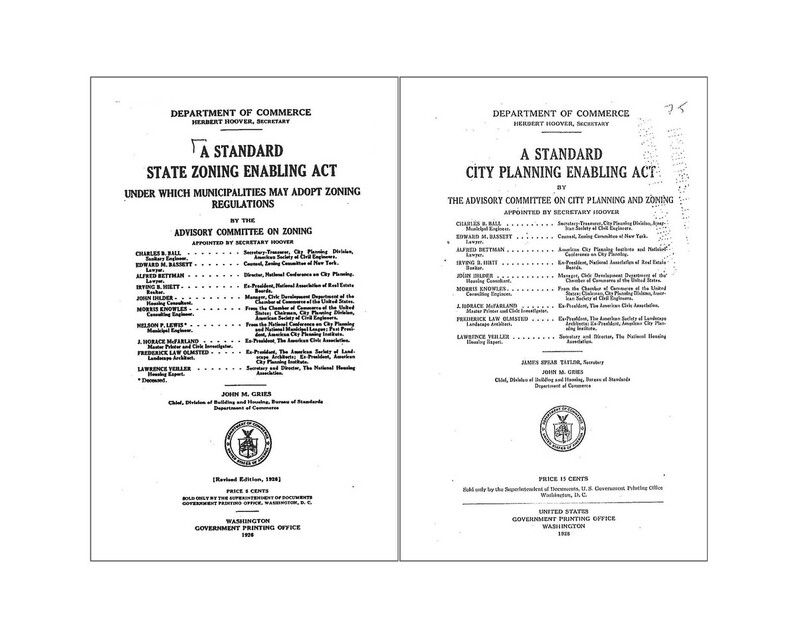 But in 1928 the Department of Commerce published another Act, the Standard City Planning Enabling Act. In this simple and clear publication the DoC makes the case that any city should be laid out, first and foremost, through the projection of streets. It is essentially an act which enables cities to determine what is public (streets) and what is private (blocks), and that these things are carved out of a lot of land, regardless of its ownership or status. In the 90 years since, the first publication has had far more impact on the physical landscape of the United States, and as a result, much of the rest of the world. The basis of the subdivision of land has been rendered subordinate to the idea of planning around the future use of a thing. One terribly detrimental outcome of this shift in thinking has been the idea that things should be separated. And from this idea comes a single sentence that is embedded in almost every subdivision ordinance in every jurisdiction throughout the US, ‘Local streets shall be so laid out that their use by throughtraffic will be discouraged.’ This actually comes from the City of Atlanta’s 1957 Subdivision Ordinance. Embedded in this simple sentence is the idea that we shouldn’t be designing communities that are connected, and more specifically connected by streets. Local Streets Local streets shall be so laid out that their use by through traffic will be discouraged. The diagram below shows us what the outcome of this simple, seemingly innocuous sentence (and one that is almost still universally supported in planning bureaus and neighborhoods alike). If we do this, however, it means we will never end up with anything like the great cities that were laid out and built prior to this transformation. 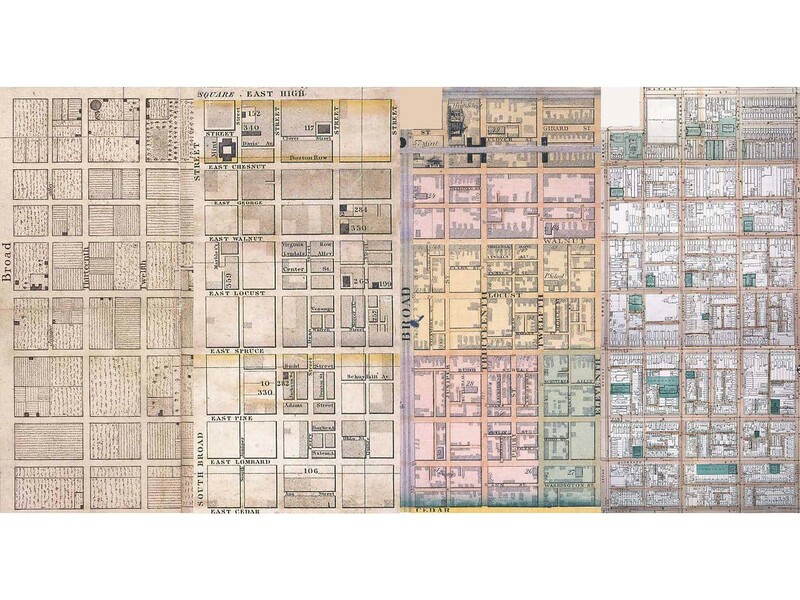 If we think about a city like Philadelphia (see image below), the first thing done was laying out of streets, even though, as the first image clearly indicates, this was initially used as an area for agriculture. 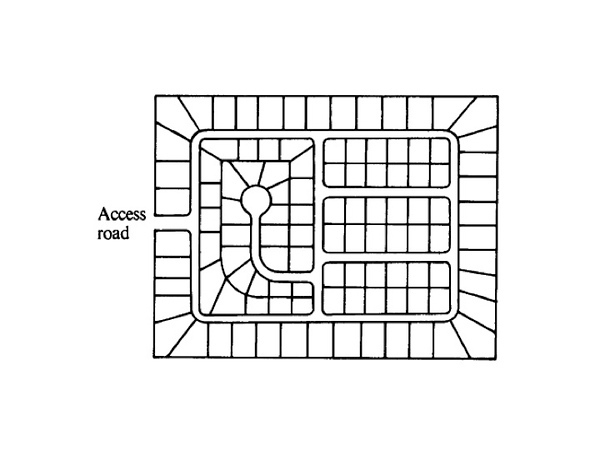 This series of plans of the city clearly shows how a system of streets can provide a simple way for cities to grow, and also, thankfully, a city where people can walk. In 1957, in Atlanta, not too many people were thinking about walking. We now have subdivision ordinances that are incredibly complex, tied to comprehensive plans that are silent on the physical layout of cities (and scared to death to ever imagine telling people where future streets should be located), and driving cities to make places that are unwalkable, disconnected and completely unlike the original city of Philadelphia and its counterparts. In fact most subdivision regulations make it illegal to replicate Philadelphia, Manhattan, Savannah, Chicago or any other great city plan. But there is a very simple solution. It may be hard to imagine, but a simple, two-sentence subdivision ordinance could actually result in much better places, much better cities. What would the result of this be? Every new development or expansion of a city, or even a new city, would be connected and walkable. It might not be Savannah, ingenuous and beautiful, but it will never, by law, be the sprawling suburbs of the vast majority of 20th century (and unfortunately 21st century) America. In two simple sentences we could have a system that is incredibly clear, simple to understand, administer and build. This won’t guarantee great cities but it will preclude horrible cities. With this ordinance you could build Philadelphia. The question we should be asking ourselves is why wouldn’t we do this. Of course there are a million reasons why not, but every one of those reasons, without exception, results in less possibility for great cities. One caveat, the number 2400 feet is not sacred. Each jurisdiction could, and would, change this to suit their needs (think Portland – 800 feet or Manhattan – 2000 feet, etc). The dimension should be the smallest number that accommodates the most varied set of building types. Remember the Empire State Building sits on a parcel of land that has a perimeter of about 1000 feet, and it’s a pretty big building. This article by David Green was published by the Douglas C Allen Institue for the study of cities. David Green, AIA LEED AP, is an Urban Design Leader and Principal at Perkins+Will in London and a founding board member of the Doug Allen Institute.